So, I thought I might share some of my fun finds. 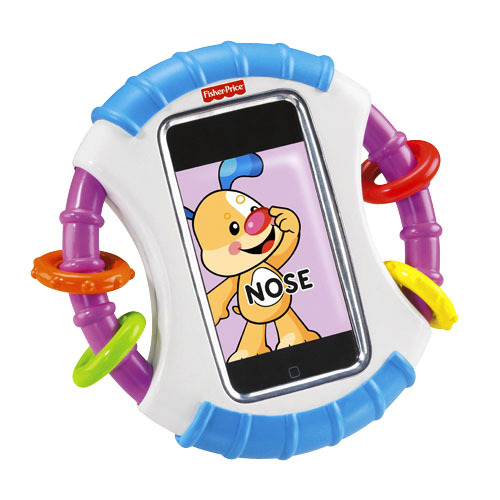 One of the fun toys that I have found for Lincoln is the Laugh & Learn Apptivity Case. I know some mommies don’t really like to use technology at a young age, but at our house it is pretty much all around. This case is so cool because it allows them to look at your Iphone or Ipod touch and not drool all over it or break it by dropping it. It also comes with some suggestions for some great app’s suggestions for counting and animal sounds. It is also great because of the round wheel shape that provides handles on the side for them to easily hold and watch videos or movies that you have uploaded. It will also still allow us to use it to play his “sleepy” music. Overall a great product and a great invention that I thought I would share with you! This entry was posted in Motherhood, Product Review and tagged Fisherprice, Product Review by Christie. Bookmark the permalink.